World map displaying the World War II participants. The Allies depicted in green (those in light green entered after the attack on Pearl Harbor), the Axis Powers in orange, and neutral countries in gray. The Axis Powers is a term for those participants in World War II opposed to the Allies. The three major Axis powers, Nazi Germany, Fascist Italy, and the Japanese empire, referred to themselves as the "Rome-Berlin-Tokyo Axis." The Axis powers ruled empires that dominated large portions of Europe and the Asia-Pacific region, but they were ultimately defeated at the end of World War II. Like the Allies, membership of the Axis was fluid, and some nations entered and later left the Axis during the course of the war. The Axis powers had expansionist and imperial plans that were threatening to the Allies, coupled with political systems that concentrated power in the hands of leaders and elevated a racial or ideological elite above subject, inferior peoples. Not all who aligned themselves with the Axis shared the same political ideology; some did so opportunistically in order to acquire territory, or because they were already at odds with one of the Allies. Generally, however, the Axis powers were governed dictatorially by totalitarian regimes, while the Allies were democracies. The Axis powers restricted freedom of religion for minorities and others, while the Allies upheld religious liberty. On September 18, 1931, Manchuria was an object of Japanese invasion during the Mukden incident. Italy, facing opposition to its war in Abyssinia from the League of Nations, forged an alliance with Germany, which had withdrawn from the League in 1933. The term was first used by Benito Mussolini, in November 1936, when he spoke of a Rome-Berlin axis in reference to the treaty of friendship signed between Italy and Germany on October 25, 1936. The two countries would form an "axis" around which the other states of Europe could revolve. Later, in May 1939, this relationship transformed into an alliance, dubbed the "Pact of Steel." The Axis was extended to include Japan as a result of the Anti-Comintern Pact of November 25, 1936, and the Tripartite Treaty of September 27, 1940. The alliance was subsequently joined by Hungary (November 20, 1940), Romania (November 23, 1940), Slovakia's puppet government (November 24, 1940), and Bulgaria (March 1, 1941). The Italian name Roberto briefly acquired a new meaning from "Roma-Berlino-Tokyo" between 1940 and 1945. Yugoslavia joined on March 25, 1941, but a British-supported coup d'état two days later put Yugoslavia's participation in question (although King Peter II of Yugoslavia actually declared his adherence to the treaty), leading to a German occupation of Yugoslavia in April. When Nazi Germany and Fascist Italy invaded the Kingdom of Yugoslavia, several nationalist groups used this to their advantage. The territory roughly consisting of Croatia and Bosnia and Herzegovina was made into a puppet state called the "Independent State of Croatia." Other parts of Yugoslavia were either annexed, governed directly by the coalition forces, or by other locals (for example, General Milan Nedić in Serbia). On April 10, 1941, the extreme-right nationalist Ustaše organization proclaimed the "Independent State of Croatia" on parts of occupied Yugoslav territory. The leader of the state was Ante Pavelić. The state was largely founded on nationalist aspirations due to the mistreatment of Croats and other South Slavic people within Yugoslavia because of the Royal Yugoslav government's policy of pro-Serb bias. Fascist forces subsequently sent thousands of Serbs, Jews, Gypsies, and dissenting Croats and others to the concentration camps, where most of them died. In 1941 Ivan Mihailov's Internal Macedonian Revolutionary Organization (IMRO) welcomed Bulgaria's renewed control of Vardar Macedonia which was populated basically with ethnic Bulgarians. There was hardly any resistance in this area until 1944. In the beginning of September 1944, when the Bulgarian government left the Axis and declared war on Nazi Germany, Berlin offered its support if Mihailov declared Macedonia's independence, but he declined. The Yugoslav Partisan forces under the command of Josip Broz Tito, a Croat, fought a guerrilla war throughout Yugoslavia and the ISC beginning in mid-1941. By 1943 they became a major opponent, and in 1945 they were joined by the Red Army and the Bulgarian army and expelled the fascists. Croatia and other territories were then reincorporated into the second Yugoslavia, and it would be another half a century before Croatia finally gained and celebrates independence. The Italian Social Republic (Repubblica Sociale Italiana in Italian) was established in 1943 following Italy's defeat at the hands of the Allies. On July 25, 1943, King Victor Emmanuel III stripped Benito Mussolini of his powers and had him arrested upon leaving the palace. Several months later, in a spectacular raid led by Otto Skorzeny, Mussolini was freed, declared his dismissal a coup, and proclaimed it put down on September 23, 1943. On that same date he assumed control in the northern half of Italy, which he proclaimed to be the Italian Social Republic with its capital at Salò. The Republic came to an end in 1945 when Allied forces ousted the Germans from Italy. Iraq under the control of Rashid Ali al-Kaylani tried to join the Axis but there was internal resistance. When Kaylani was again appointed prime minister in 1940, King Ghazi had just passed away and the four-year-old King Faisal II assumed the throne, with his uncle Emir Abdul-Illah serving as "acting monarch." While Abdul-Illah supported the British in the war, Kaylani was strongly opposed to them and refused to allow troops to cross through Iraq to the war front. Kaylani was also opposed to those calling for him to break off ties with the Fascist government in Italy. He subsequently sent his Justice Minister, Naji Shawkat, to meet with the then German ambassador to Turkey, Franz von Papen, to win German support for his government. 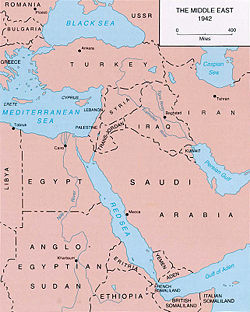 At a later meeting, in which the Mufti's private secretary acted as the representative for the Iraqi government, Kaylani assured Germany that his country's natural resources would be made available to the Axis Powers in return for German recognition of the Arab states' right to independence and political unity, as well as the right to "deal with" the Jews living in Arab lands. When Britain found out about these dealings, sanctions were immediately placed on Iraq. The last chance for Iraqi entrance on the side of Germany slipped away when the Italians began to lose control of their territory holdings in North Africa. On January 31, 1941, Kaylani was forced to resign from the post of Iraqi Prime Minister due to British pressure. The Japanese had some contact with Islamic leaders in Southeast Asia and Middle East areas, such as British Malaysia, Dutch Indies, Afghanistan, and Sinkiang, before and during the war. Among these leaders were the Sultan of Johore, Afghan Sardar Mohammad Hashim Khan, and Uiguir leader Ma Chung-ying. They coordinated some actions with Japanese agents, but these contacts did not result in significant action during the war. Certain Italian agents arrived to Persia and Afghanistan with similar purposes, but received little assistance. In the British Mandate of Palestine, the Mufti of Jerusalem, Mohammad Amin al-Husayni allied himself with Germany, visiting Hitler there in 1941. Germany supported him in his opposition to the creation of a Jewish homeland. The Mufti worked for Germany as a propagandist and also by recruiting Arabs to serve with the Axis armies. When World War II ended, he escaped from house arrest and fled to Egypt. 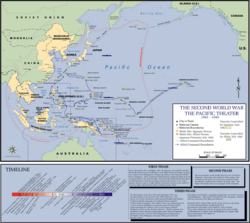 Overview map of World War II in Asia and the Pacific: Allies green, Japanese conquests yellow. During Axis operations in French Indochina, Japanese agents maintained contact with the Vichy France governor, Admiral Decoux. At the same time, these agents kept in contact with local Vietnamese chief Mandarin Tran Trong-kim, installing him as prime minister of the Vichy puppet regime. This ended with the Japanese invasion of Vichy Indochina, which Germany decided to ignore. The Philippines was not officially or technically an Axis member. However, the Japanese military installed a puppet government which governed from 1943 to 1945. The government was compelled to cooperate with the Japanese. However, the Philippine Commonwealth government-in-exile, led by President Manuel Quezon, and a significant Filipino guerrilla movement were opposed to the Japanese. Following the attack on Pearl Harbor in 1941 the United States had declared war against the Empire of Japan. Japan had been annexing East Asian territory for nearly ten years before bringing the U.S. into the war. Following Pearl Harbor, the Japanese invaded the Philippine Islands. In 1943 most high government officials had fled off the islands but a justice of the Filipino Supreme Court by the name of José P. Laurel was instructed to remain in Manila by President Manuel Quezon. Quezon went into exile to Bataan and then to the United States. It is because Laurel was such a critic of the United States that he fell in favor with the senior members of the Japanese occupying force. He was appointed President of the Philippines on October 14, 1943. Attempts were made at Laurel's life by Filipinos trying to resist the Japanese. Laurel was shot on two occasions but recovered. Laurel was instrumental in intervening in protecting Filipinos against the harsh Japanese wartime rule and policies. During the Second World War, the Japanese massacred many Filipinos, and raped and molested Filipinas. In Burma before the conflict, Japanese agents maintained contacts with Ba Maw (Saw), the indigenous Prime Minister in Burmese British administration. For this, British authorities arrested him, but the Burmese leader was liberated when Axis forces arrived. He conformed one Autonomous Pro-Japanese Government in Burma with Japanese advisers and supported by Japanese forces until 1944-45 when arriving American, British, and Chinese forces invaded and liberated the country. In British Malaysia, the Japanese sustained some contacts with the Islamic local leader, the Sultan of Johore. This leader visited Japan in 1934, received the Tenno, the Decoration of Rising Sun Great Cord and established relationships with the Japanese administration. When Japanese Forces invaded Dutch Indies, during their 1942-45 occupation, they promised total political independence and proposed the organization of a "Nation Defenders Army," under the guidance of Ahmed Sukarno, the local leader. In 1927 he founded the "Indonesian Nationalists Party," which during Japanese occupation received ideological support. After being attacked by the Soviet Union in the Winter War (1939–1940), the democratic Finland was a co-belligerent of Nazi Germany during the Continuation War (1941–1944), seeking to regain its lost territory and conquer East Karelia. Some Finns tended to view (and still do) these two conflicts as separate from World War II. In Allied usage, Finland was often referred to as an Axis country, which is often deplored as an effect of Soviet propaganda depicting the Finns as fascists in disguise. This conflicts with Finnish self-perception, which considers Finns acting only for self-preservation. The Finnish government was very careful to nurture this political separation. Finland was never a signatory to the Tripartite Treaty, and Finns refused to put Finnish army under the joint command with Germans. Also Finnish high command refused to implement German wishes which it considered too damaging to Finnish interests, like attacking Leningrad or cutting the Murmansk railroad at Louhi. The relation did more closely resemble a formal alliance during the six weeks of the Ryti-Ribbentrop Agreement, which was presented as a German condition for much needed help with munitions and air support as the Soviet offensive, coordinated with D-day, threatened Finland with complete occupation. Japanese forces began occupying Thailand on the morning of December 8, 1941. Resistance to the Japanese invaders was swift but Field Marshal Luang Phibunsongkhram, the prime minister, ordered the cessation of resistance. On December 21, an assistance treaty with Japan was signed. The Thai Phayap Army invaded British Burma alongside the Japanese, and on January 25, 1942, Thailand declared war on Britain and the United States of America. The Thai ambassador to the United States, Seni Pramoj did not deliver his copy of the declaration of war, so although the British reciprocated by declaring war on Thailand and consequently considered it a hostile country, the U.S. did not. The Seri Thai was established during these first few months. Thai forces conducted their biggest offensive of the war in May 1942, taking Kengtung in northern Burma from the Chinese 93rd Army. Parallel Seri Thai organizations were established in Britain and inside Thailand. Queen Ramphaiphanee was the nominal head of the Britain-based organization, and Pridi Phanomyong, then regent, headed its largest contingent. Aided by the military, secret airfields and training camps were established while Allied agents fluidly slipped in and out of the country. As the war dragged on, the Thai population came to resent the Japanese presence. In June 1944, Phibun was overthrown in a coup engineered by the Seri Thai. The new civilian government attempted to aid the Seri Thai while at the same time maintaining cordial relations with the Japanese. After the war, U.S. influence prevented Thailand being treated as an Axis country, but Britain demanded three million tons of rice as reparations and the return of areas annexed from the British colony of Malaya during the war and invasion. Thailand also had to return the portions of British Burma, French Cambodia and French Laos that had been taken. In order to gain strength before the inevitable all-out war, under secret provisions in the Molotov-Ribbentrop Pact, the Soviet Union invaded several eastern European nations, which were previously part of the Russian Empire for centuries, on September 17, 1939. Poland was partitioned between Germany and the Soviet Union. The Baltic States capitulated to the Soviets on September 28. The Soviets invaded another part of former Russian Empire, Finland, on November 30, 1939 and seized minor parts of its territory. Relations with the Germans deteriorated after disagreements and mutual suspicions. Adolf Hitler never intended to continually honor the pact and invaded the Soviet Union on June 22, 1941, thus ending the treaty. The Provisional Government of Free India was a shadow government led by Subhas Chandra Bose. Bose was an Indian nationalist who did not believe in Mahatma Gandhi's peaceful methods for achieving independence. Several key factors were vital in Bose's rise to power. The first was that even though India was a colony, its army was largely autonomous. The second factor was that with Britain at war with Germany, an uprising could not be put down as easily as in years prior. The third and most important factor was the advance of the Japanese Empire through Asia. The Japanese Empire had earlier established Manchukuo as independent in 1932 and later Indonesia and Vietnam independent without the approval of the latter two's European colonial masters. Bose led several units in mutiny against the British government and had come into alliance with the invading Japanese Empire to India's east. Bose and A.M.Sahay, another local leader, received ideological support from Mitsuru Toyama, chief of the Black Dragon Society along with Japanese Army advisers. Other Indian thinkers in favor of the Axis cause were Asit Krishna Mukherji, a friend of Bose and husband of Savitri Devi Mukherji, one of the women thinkers in support of the German cause, Bal Gangadhar Tilak, and the Pandit Rajwade of Poona. Bose was helped by Rash Behari Bose, founder of the Indian Independence League in Japan. Bose declared India's independence on October 21, 1943. With its provisional capital at Port Blair on the Nicobar Islands, the state would last two more years until August 18, 1945, when it officially became defunct. In its existence it would receive recognition from nine governments: Nazi Germany, Imperial Japan, Italy, Independent State of Croatia, Reformed Government of the Republic of China, Thailand, Burma (under Ba Maw), Manchukuo, and the Philippines under de facto (and later de jure) president José Laurel. Although Spain under Generalissimo Francisco Franco stayed neutral throughout the war, the country was ideologically aligned with the Axis powers (the Nationalists had received considerable military support from Germany and Italy during the Spanish Civil War). Franco did allow Spaniards to volunteer for what was described as a struggle against Bolshevism, and eventually over 40,000 Spanish volunteers fought on the Axis side during World War Two (primarily on the Eastern Front) under the auspices of the Blue Division. Manchukuo, meaning Manchuria, was a puppet state set up by Japan on February 18, 1932. The country's independence was not recognized by the League of Nations, causing Japan to withdraw from the League. Italy, Germany, and the Japanese-puppet government of China under Wang Jingwei were the only major governments to recognize the Japanese backed state. In the following order, these other states later recognized the existence of this nation: Costa Rica, El Salvador, Ba Maw Burmese Nation, Thailand, the Indian government of Subhas Chandra Bose, and The Vatican. Manchuria met its dissolution in 1945 following Japan's defeat at the end of World War II. In Manchukuo there were also some anti-Communist White Russians, leaders known as the "Duce" Konstantin Vladimirovich Rodzaevsky and General Kislistin. They sought to persuade the Imperial Japanese Army to invade Russian Siberia, for the purpose of establishing an anti-Soviet, pro-Axis Russian government in the Russian Far East. Mengjiang (Mengchiang) was a client state organized by Japan on February 18, 1936. The country's independence was merely rhetorical, since principal political power remained firmly with "local" Japanese establishment. The local leader under the Japanese administration was the Mongol Prince Demchugdongrub. Mengjiang vanished in 1945 following Japan's defeat ending World War II and the invasion of Soviet and Red Mongol Armies. Reformed Government of the Republic of China is a term applied to a puppet state in central China, during the Second Sino-Japanese War (1937-1945). This short-lived state was founded March 29, 1940, by Wang Chingwei, who became Head of State of the Japanese supported collaborator government based in Nanjing. Its flag was similar to that of the Republic of China, whose flag is still flown in Taiwan. On September 9, 1945, following the defeat of Japan in World War II, the area was surrendered to General Ho Ying-ching, a Nationalist General loyal to Chiang Kai-shek. Additionally, Japanese forces organized other minor "independent" nations or political entities in occupied lands on the Chinese mainland. Following the successful invasion of France by German forces and the capture of Paris, France surrendered to Germany on June 24, 1940. Germany divided France into occupied and non-occupied zones with the latter under the leadership of the Vichy government, which was the de facto government of France led by prime minister Henri Philippe Pétain. The occupation resulted in a divided French state splintered into Vichy France and France. Charles de Gaulle directed forces called the Free French Forces in exile. The Allies feared that Vichy French-controlled colonies around the world would be used by Axis forces as bases, and many were attacked by Allied forces, beginning with the destruction of the French Fleet at Mers-el-Kebir on July 3, 1940. Vichy forces often fought back vigorously, and were occasionally assisted by German, Italian, or Japanese forces. Perhaps the most notable example of a Vichy-controlled colony used as an Axis base was French Indochina, which became the starting point for the Japanese invasions of Thailand, Malaya, and Borneo. Like the other states created by the Axis, Vichy France would not remain on any post-bellum maps. Vichy France ceased to exist on September 3, 1944, following the victory of Allied forces and restoration of the French Republic over all Vichy territories, colonies, and land holdings. During Axis armed actions of Operation Barbarossa on June 22, 1941, along with occupation plans in Reichskommissariat der Ostland and Reichskommissariat der Ukraine, Axis forces developed one certain political and administrative experiment between the controlled lands, in the so-called Lokot Republic. This territory of anti-Soviet Russian, pro-Axis local administration under Axis direct control, was first lead by Constantine Voskoboinik, and later succeeded for Bronislaw Kaminski. Kaminski was also the commander of the native anti-communist forces of Russian National Liberation Army (RONA). The idea of liberation from the Bolsheviks found noticeable support in Russian-occupied areas. This was one example of effective collaboration between natives and the Axis forces. Another Russian anti-communist leader with similar thinking was Andrey Vlasov and his local anti-Stalinist, pro-Axis force of the Russian Liberation Army (ROA). The Lokot Republic's life came to an end in 1943, soon after the war on the Eastern Front changed course, following the Battle for Stalingrad. During the Axis force occupation period, there was an attempt to establish a similar puppet state in Belarus with a local government established under the name of Belarusian Central Rada (BCR), with state symbols similar to the ancient Belarusian nation. The chairman of the BCR was Radasłaŭ Astroŭski). This "nation" vanished after the Axis defeat on the Eastern Front in 1944. Under Axis direct military administration in Reichskommissariat der Ostland and Reichskommissariat der Ukraine, the Axis powers managed political control among some native collaborators, and permitted certain rights and supported local culture for the purpose for gaining local goodwill. In the Ukraine there were some local nationalists who proposed a nominal independence or autonomy. Axis military authorities approved the nationalist's suggestions and permitted some military volunteer units to join with Axis forces in controlling the occupied territories. On the contrary, the Axis civil administration, assigned at Schleshwig-Holstein Gauleiter Heinrich Lohse (for Ostland) and East Prussia Gauleiter Erich Koch (for Ukraine) proved harsh. They massively exploited natural resources, administered local worker deportations, and enforced measures against Jews, among other practices. Alfred Rosenberg, the German commander who commenced the Axis Eastern Front campaign, suggested administrative re-organization for the future USSR in Reichskommissariats: Ostland (Baltic States),Ukraine, Kaukassus (Caucasia), and Moskau (Moscow) and the rest of Russian European surrounding areas. These territories extended from the European frontier to Arkhangelsk-Astrakhan. Rosenberg's proposed views were in line with "Lebensraumpolitik" and "Lebensraum im Osten" (the creation of more living space for Germans in the east), geopolitical strategies for future German eastward expansion, and benefits for "Aryan" generations well into the coming centuries. These military and civil administrative policies and respective ambitious geopolitical and expansionist plans were maintained until the Axis military situation was turned following the battles at Stalingrad and Kursk during 1943-1944. The Axis forces in North Asia during the Pacific War attempted the organization of a Client State in Soviet Far East, similar to Far Eastern Republic. The Tanaka Memorial and Hakko Ichiu geopolitical doctrines between the Japanese strategic planning for mainland Asia (1905–1940), and their eventual land invasion of Siberia, led to the foundation of a political entity in the Russian Far East. Lead by the White Russian chieftain Konstantin Vladimirovich Rodzaevsky and General Kislistin, under orders of Axis direct administration, a similar form of ancient Japanese administration was set up in Baikal, Khabarovsk and Vladivostok during 1918-1922. This administration also included the Kamchatka, which they occupied from 1918 until 1927. These leaders ordered the establishing of "counter-revolutionary anti-soviet," pro-Axis movement and a new order government. These political entities served to "Bulwark" along the boundaries of Chosen (Korea) and Manchukuo (Manchuria), against Russian Soviet influence. The excuse for such political entities used by Japan was to establish "order" in Siberia, over the "chaos" provoked by supposed Soviet defeat by the victorious Axis Forces along the European Eastern Front and to prevent the eventual American aid to the Soviet Union's Government, finding refuge in these eastern territories. At the same time these areas served to "springboard," the next anti-Stalinist operations in Siberia, along the borders of Outer Mongolia. Axis commanders considered Red Army detachments in the Far East to be "easy prey" under these circumstances and expected their total defeat in December 1941. These plans, originally drawn up during 1929-1939 Russo-Japanese Incidents, were later considered during 1941–1942 as the eventual purpose of the Eastern European Front Operation Barbarossa. The plans called for forces to at the Volga river by the end of July 1941. This was the time chosen to commence operations in the area. This project was definitively stopped with the Axis defeat in 1943 at Stalingrad. Japan, under Emperor Hirohito, Prime Minister Hideki Tojo (and in the last days of the war, Kuniaki Koiso and Kantaro Suzuki). Denmark (joined the Anti-Comintern Pact in 1941). Thailand, under Field Marshal Luang Phibunsongkhram. Provisional Government of Free India, under Subhas Chandra Bose. This page was last modified on 4 May 2016, at 14:58.